This article is about the 1984 film. For other films titled Godzilla, see Godzilla (disambiguation). The Return of Godzilla, released in Japan as Godzilla (ゴジラ, Gojira, also known as Godzilla 1984) is a 1984 Japanese kaiju film featuring Godzilla, produced and distributed by Toho. The film is directed by Koji Hashimoto, with special effects by Teruyoshi Nakano and stars Ken Tanaka, Yasuko Sawaguchi, Yosuke Natsuki, and Keiju Kobayashi, with Kenpachiro Satsuma as Godzilla. It is the 16th film in the Godzilla franchise and the first film in the Heisei series, despite having been produced during the Shōwa period. The Return of Godzilla serves as both a sequel to the original 1954 film and a reboot of the franchise that ignores the events of the Shōwa films, placing itself in line with the darker tone and themes of the original film and returning Godzilla to his destructive, antagonistic roots. 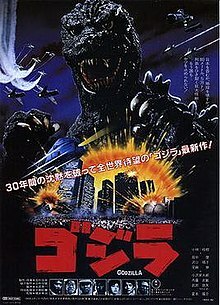 In 1985, New World Pictures released Godzilla 1985, a heavily re-edited American adaptation of the film which included additional footage, Raymond Burr reprising his role from Godzilla, King of the Monsters!, as well as being produced, filmed, and edited with the same techniques. The Japanese fishing vessel Yahata-Maru is caught in strong currents off the shores of Daikoku Island. As the boat drifts into shore, the island begins to erupt, and a giant monster lifts itself out of the volcano. A few days later, reporter Goro Maki is sailing in the area and finds the vessel intact but deserted. As he explores the vessel, he finds all the crew dead except for one young man called Hiroshi Okumura, who has been badly wounded. Suddenly a giant Shockirus sea louse attacks him but he is saved by Okumura. In Tokyo, Okumura realizes by looking at pictures that the monster he saw was a new Godzilla. Maki writes an article about the account, but the news of Godzilla's return is kept secret and his article is withheld. Maki visits Professor Hayashida, whose parents were lost in the 1954 Godzilla attack. Hayashida describes Godzilla as a living, invincible nuclear weapon able to cause mass destruction. At Hayashida's laboratory, Maki meets Okumura's sister, Naoko, and informs her that her brother is alive and at the police hospital. A Soviet submarine is destroyed in the Pacific. The Soviets believe the attack was perpetrated by the Americans, and a diplomatic crisis ensues, which threatens to escalate into nuclear war. The Japanese intervene and reveal that Godzilla was behind the attacks. The Japanese cabinet meets to discuss Japan's defence. A new weapon is revealed, the Super X, a specially-armored flying fortress that will defend the capital. The Japanese military is put on alert. Godzilla attacks the Ihama nuclear power plant. While Godzilla is feeding off the reactor, it is distracted by a flock of birds and leaves the facility. Hayashida believes that Godzilla was distracted instinctively by a homing signal from the birds. Hayashida, together with geologist Minami, propose to the Japanese Cabinet, that Godzilla could be lured back to Mt. Mihara on Ōshima Island by a similar signal, and a volcanic eruption could be started, capturing Godzilla. Prime Minister Mitamura meets with Soviet and American envoys and declares that nuclear weapons will not be used on Godzilla, even if it were to attack the Japanese mainland. Meanwhile, the Soviets have their own plans to counter the threat posed by Godzilla, and a Soviet control ship disguised as a freighter in Tokyo Harbor prepares to launch a nuclear missile from one of their orbiting satellites should Godzilla attack. Godzilla is sighted at dawn in Tokyo Bay heading towards Tokyo, causing mass evacuations. The Japanese Air Self Defense Force attacks Godzilla but fails to stop its advance on the city. Godzilla soon emerges and makes short work of the JSDF stationed there. The battle causes damage to the Soviet ship and starts a missile launch count-down. The captain dies as he attempts to stop the missile from launching. Godzilla proceeds towards Tokyo's business district, wreaking havoc along the way. There, it is confronted by four laser-armed trucks and the Super X. Because Godzilla's heart is similar to a nuclear reactor, the cadmium shells that are fired into its mouth by the Super X seal and slow down its heart, knocking it unconscious. The count-down ends and the Soviet missile is launched. The Americans intervene and fire a counter-missile at the Soviet missile. Hayashida and Okumura are extracted from Tokyo via helicopter and taken to Mt. Mihara to set up the homing device before the two missiles collide above Tokyo. The two missiles collide, producing an electrical storm and an EMP, which revives Godzilla once more and temporarily disables the Super X.
Godzilla and the Super X battle through the streets. Godzilla finally destroys the Super X and continues its rampage, until Hayashida uses the homing device to distract it. Godzilla leaves Tokyo and swims across the Japanese sea, following the homing device to Mt. Mihara. There, Godzilla follows the device and falls into the mouth of the volcano. Okumura activates detonators at the volcano, creating a controlled eruption that traps Godzilla inside. "We went back to the theme of nuclear weapons, since that was the theme of the original film. Japan has now learned three times what a nuclear disaster is, but at that time Japan had already had two. The problem was Japanese society was gradually forgetting about these disasters. They were forgetting how painful it had been. Everyone in Japan knew how scary nuclear weapons were when the original movie was made, but it wasn't like that by the 1980s. So in those meetings, we decided to remind all those people out there who had forgotten." After the box office failure of Terror of Mechagodzilla, Toho attempted to reinvigorate the franchise several times during the late 1970s and early 1980s. The first attempt was the announcement of a color remake of the original 1954 film entitled The Rebirth of Godzilla in 1977, but the project was shelved. A year later, it was announced that Toho would develop a film jointly with UPA studios entitled Godzilla vs. the Devil, though this, along with UPA producer Henry G. Saperstein's proposed Godzilla vs. Gargantua, also never materialized. Godzilla series creator Tomoyuki Tanaka took charge of reviving the franchise in 1979, Godzilla's 25th anniversary, intending to return the series to its dark, anti-nuclear roots in the wake of the Three Mile Island accident. Hoping to win back adult audiences alienated by the fantastical approach to Godzilla films taken during the 1970s, Tanaka was further encouraged in his vision by the contemporary success of adult-oriented horror and science fiction movies like King Kong, Invasion of the Body Snatchers, Alien and The Thing. A draft story entitled The Resurrection of Godzilla was submitted by Akira Murao in 1980, and had Godzilla pitted against a shape-shifting monster called Bakan in the backdrop of an illegal nuclear waste disposal site, though the project was cancelled due to budgetary concerns. In 1983, American director Steve Miner proposed directing a Godzilla film at his own expense. Toho approved of the project, and Miner hired Fred Dekker to write the screenplay and paleosculptor Steve Czerkas to redesign the monster. The project was however hampered by Miner's insistence on using prohibitively costly stop-motion animation and shooting the film in 3D, and was thus rejected by major American movie studios. Under pressure from a 10,000-member group of Japanese Godzilla fans calling themselves the "Godzilla Resurrection Committee", Tanaka decided to helm a Japanese film for "strictly domestic consumption" to be released jointly alongside Miner's movie. In an effort to disavow Godzilla's increasingly heroic and anthropomorphic depiction in previous films, Tanaka insisted on making a direct sequel to the original 1954 movie. He hired screenwriter Shuichi Nagahara, who wrote a screenplay combining elements of the previously cancelled The Resurrection of Godzilla and Miner's still unproduced film, including an intensification of hostilities during the Cold War and a flying fortress which fires missiles into Godzilla's mouth. Koji Hashimoto was hired as director after Ishirō Honda declined the offer, as he was assisting Akira Kurosawa with Kagemusha and Ran, and felt that the franchise should have been discontinued after the death of Eiji Tsuburaya. Composer Akira Ifukube was offered to score the film but respectfully declined. At the time, it was rumored that Ifukube refused to participate in the film due to the changes made to Godzilla, stating, "I do not write music for 80-meter monsters". However, this quote was later clarified, by Ifukube's biographer Erik Homenick and Japanese Giants editor Ed Godziszewski, as a joke spread by fans which was later misinterpreted as fact. Ifukube declined to score the film due to his priorities, at the time, teaching composition at the Tokyo College of Music. 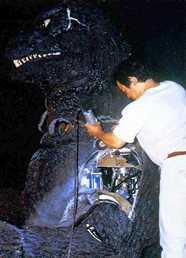 The special effects were again directed by Teruyoshi Nakano, who had directed the special effects of several previous Godzilla films. The decision was made by Tanaka to increase the apparent height of Godzilla from 50 metres (160 ft) to 80 metres (260 ft) so that Godzilla would not be dwarfed by the contemporary skyline of Tokyo. This meant that the miniatures had to be built to a ​1⁄40th scale, and this contributed to an increase in the budget of the film to $6.25 million. Tanaka and Nakano supervised suit-maker Noboyuki Yasumaru in constructing a new Godzilla design, incorporating ears and four toes, features not seen since Godzilla Raids Again. Nakano insisted on infusing elements into the design that suggested sadness, such as downward-facing eyes and sloping shoulders. Suit construction took two months, and consisted of separately casting body-part molds with urethane on a pre-built, life-size statue of the final design. Yasumaru personally took charge of all phases of suit-building, unlike in previous productions wherein the different stages of suit-production were handled by different craftsmen. The final suit was constructed to accommodate stuntman Hiroshi Yamawaki, but he declined suddenly, and was replaced by veteran suit actor Kenpachiro Satsuma, who had portrayed Hedorah and Gigan in the Showa Era. Because the 110 kg (240 lb) suit wasn't built to his measurements, Satsuma had difficulty performing, being able to last only ten minutes within it, and losing 12 pounds during filming. Hoping to avoid having Godzilla move in an overly human fashion, Nakano instructed Satsuma to base his actions on Noh, a traditional Japanese dance. Taking inspiration from the publicity surrounding the 40-foot tall King Kong model from Dino De Laurentiis's 1976 film of the same name, Toho spent a reported $475,000 on a 16-foot high robotic Godzilla (dubbed "Cybot") for use in close-up shots of the creature's head. The Cybot consisted of a hydraulically-powered mechanical endoskeleton covered in urethane skin containing 3,000 computer operated parts which permitted it to tilt its head, and move its lips and arms. Unlike previous Godzilla suits, whose lower jaws consisted of wire-operated flaps, the Cybot's jaws were hinged like those of an actual animal, and slid back as they opened. A life-size, crane operated foot was also built for close-up shots of city destruction scenes. The Return of Godzilla was released on December 15, 1984 in Japan where it was distributed by Toho. The film's budget was $6.25 million. It was a reasonable success in Japan, with attendance figures at approximately 3,200,000 admissions, and the box office gross being ¥2.89 billion. Despite its American re-edit receiving negative reviews, the original Japanese cut of the film has been much more well-received by critics and fans. In 1985, the film won the Japan Academy Award for Special Effects. WatchMojo.com listed The Return of Godzilla as #8 on their "Top 10 Godzilla Movies" list. Shortly after the film's completion, Toho's foreign sales division, Toho International Co., Ltd, had the film dubbed into English by an unidentified firm in Hong Kong. No cuts were made, though credits and other titles were accordingly rendered in English. The International English dub features the voice of news anchor and radio announcer John Culkin in the role of Goro Maki, and actor Barry Haigh as Prime Minister Mitamura. The English version fully dubs all dialogue into English, including that of the Soviet and American characters. The International English dub was released on VHS in the UK by Carlton Home Entertainment on July 24, 1998. This movie has never been released in USA and Canada for some reason. In 2016, the International English dub was included on the U.S. DVD and Blu-Ray releases from Kraken, though the audio mix was not the original monaural track that was originally heard on Toho's English language prints. The English dialogue was originally mixed with an alternate music and effects track that contained different music edits and sound effects from the Japanese theatrical version, most notably a distinct "cry" produced by Godzilla during the film's ending. The U.S. home video version instead uses the conventional music and effects track used for the regular Japanese version mixed in DTS 5.1 surround sound instead of mono. After the film's lackluster performance in the Japanese box office and the ultimate shelving of Steve Miner's Godzilla 3D project, Toho decided to distribute the film overseas in order to regain lost profits. New World Pictures acquired The Return of Godzilla for distribution in North America, and changed the title to Godzilla 1985, bringing back Raymond Burr in order to commemorate the 30th anniversary of Godzilla: King of the Monsters!. Originally, New World reportedly planned to re-write the dialogue in order to turn the film into a tongue-in-cheek comedy starring Leslie Nielsen (à la What's Up, Tiger Lily? ), but this plan was reportedly scrapped because Raymond Burr expressed displeasure at the idea, taking the idea of Godzilla as a nuclear metaphor seriously. The only dialogue left over from that script was "That's quite an urban renewal program they've got going on over there," said by Major McDonahue. All of Burr's scenes were filmed in one day to suit his schedule. He was paid US $50,000. The reverse shots, of the actors he was speaking to, were filmed the next day, and the American filming was completed in three days. One of the most controversial changes done on the film was having Soviet Colonel Kashirin deliberately launch the nuclear missile rather than die in attempting to prevent its launch. Director R. J. Kizer later attributed this to New World's management's conservative leanings. The newly edited film also contained numerous product placements for Dr Pepper, which had twice used Godzilla in its commercials. Dr Pepper's marketing director at one point insisted that Raymond Burr drink Dr Pepper during a scene, and the suggestion was put to the actor by Kizer. Burr reportedly responded by "[fixing] me with one of those withering glares and just said nothing." Roger Ebert and Vincent Canby gave the film negative reviews. Gene Siskel described the movie as "dull." In May 2016, Kraken Releasing revealed plans to release the original Japanese version of The Return of Godzilla and its international English dub on DVD and Blu-ray for the first time in North America on September 13, 2016. However, it was also revealed that the Americanized version of the film, Godzilla 1985 would not be featured in the release due to on-going copyright issues concerning music cues that New World Pictures borrowed from Def-Con 4 for use in Godzilla 1985. ^ a b c d e f g h i Galbraith IV, Stuart (2008). The Toho Studios Story: A History and Complete Filmography. Scarecrow Press. p. 341. ISBN 1461673747. ^ "The Return of Godzilla (1984) English Opening/End Credit Titles". Dailymotion. Retrieved December 27, 2016. ^ a b "『ゴジラ』の詳細情報". Eiga Ranking. Retrieved 18 February 2019. ^ a b Aiken, Keith (May 19, 2016). "Exclusive: The Return of Godzilla Blu-ray & DVD Details from Kraken Releasing". Scifi Japan. Retrieved May 19, 2016. ^ Lusty-Cavallari, Saro (May 20, 2014). "Reawakening The Monster: The Long History of Godzilla Reboots". Four Three Film. Retrieved March 29, 2018. ^ Ryfle 1998, p. 362. ^ a b c Ryfle, S. (1998). Japan’s Favorite Mon-Star: The Unauthorized Biography of the Big G. Toronto: ECW Press. pp. 215–28. ISBN 1550223488. ^ a b Kalat, David (2010). A Critical History and Filmography of Toho's Godzilla Series (2nd ed.). Jefferson, N.C.: McFarland & Co. pp. 156–161. ISBN 978-0-7864-47-49-7. ^ a b c d e Ryfle, S. (1998). Japan’s Favorite Mon-Star: The Unauthorized Biography of the Big G. Toronto: ECW Press. pp. 229–35. ISBN 1550223488. ^ Galvan, Patrick (August 30, 2018). "Urban Legends: "I Do Not Write Music For 80-meter Monsters!"". Toho Kingdom. Retrieved September 6, 2018. ^ a b Tsutsui, William (2004). Godzilla on my mind: fifty years of the king of monsters. New York, New York: Palgrave MacMillan. p. 65. ISBN 1-4039-6474-2. ^ WatchMojo.com (February 26, 2014). "Top 10 Godzilla Movies". Youtube. Retrieved March 7, 2016. ^ Romero, Anthony (August 22, 2016). "Blu-ray: Godzilla 1984: The Return of Godzilla (Kraken Releasing)". Toho Kingdom. Retrieved September 13, 2016. ^ "The Return of Godzilla, British Board of Film Classification". June 6, 1998. Retrieved September 13, 2016. ^ Romero, Anthony (May 27, 2016). "Interview: Matt Greenfield". Toho Kingdom. Retrieved September 13, 2016. ^ "The Return of Godzilla - Audio mix differences (updated)". January 25, 2015. Retrieved September 13, 2016. ^ Romero, Anthony (July 9, 2015). "Blu-ray: Blu-ray: Godzilla  (Toho)". Toho Kingdom. Retrieved September 13, 2016. ^ a b Ryfle, S. (1998). Japan’s Favorite Mon-Star: The Unauthorized Biography of the Big G. Toronto: ECW Press. pp. 237–41. ISBN 1550223488. ^ Ebert, Roger (September 20, 1985). "Review". Chicago Sun-Times. ^ Canby, Vincent. "Review". New York Times.